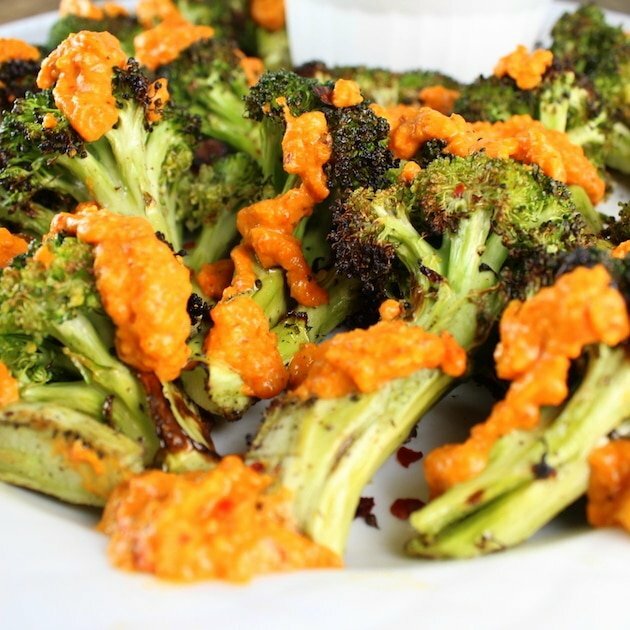 Grilled Broccoli with Garlic Roasted Red Pepper Sauce – another delightful way to eat your broccoli. 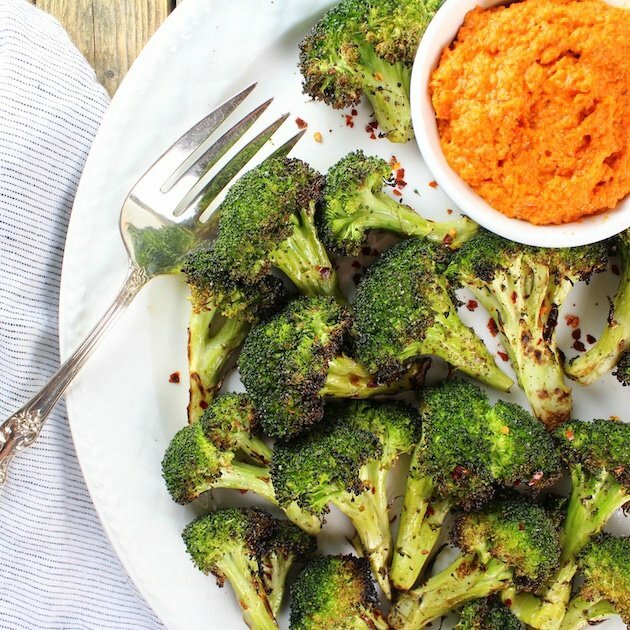 A delicious combination of roasted red pepper, garlic and almonds, smoky and spicy paprika, tomatoes and slightly charred broccoli. YUM! There are several reasons some vegetables get a bad wrap: one, because they aren’t seasoned properly; and two, they’re cooked too long and become bitter or even slimy? Whoa? Yes – it’s so true. Have you ever over-cooked asparagus or eggplant? You would know if you had – Slimefest 2016 I tell ya!? Now don’t get me wrong. 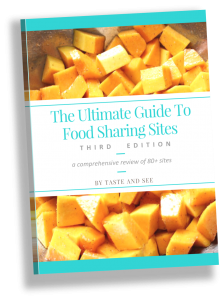 I have a fierce appreciation for – and absolutely love – vegetables!? 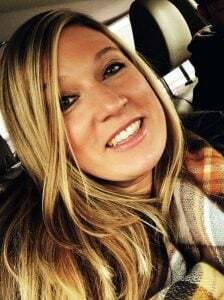 So much that as a teenager, I would go down to my family’s canning shelves in the basement, grab a pint of lima beans, sauté them with some butter and salt and devour! Heaven on earth for sure!? 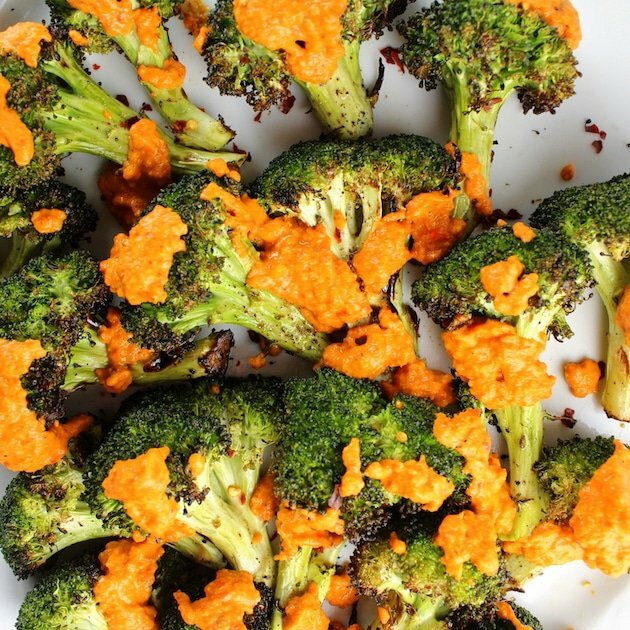 One of the inspirational vegetable tapas we tried that evening was Charred Broccoli with Romesco Sauce. OMG Yumalicious!!? 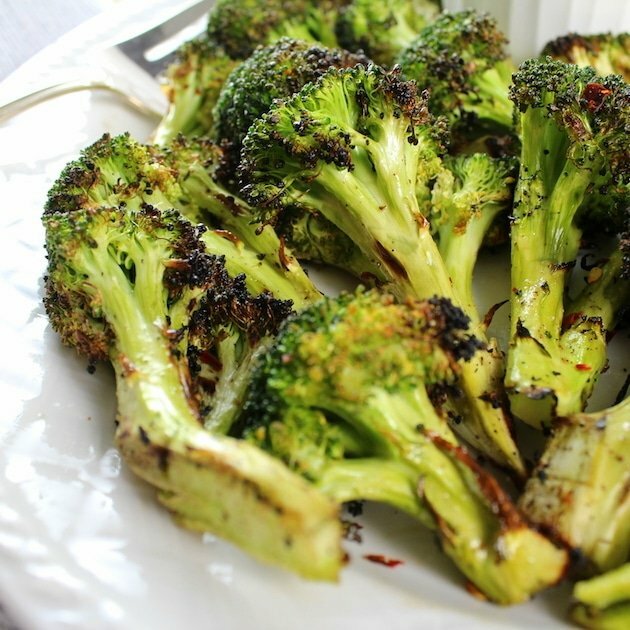 The broccoli had this slight blackening on the edges of the florets and this amazing grilled smoky flavor. 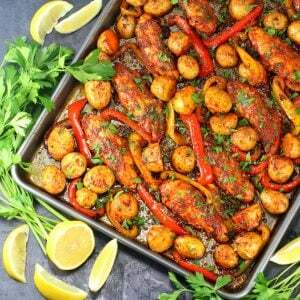 The sauce was garlicky, with some red pepper, tomatoes, almonds and just a bit of spicy heat. It was probably my favorite tapa of the night – and there was zero meat involved (I don’t even know myself anymore). It’s probably because broccoli contains protein – yep not even kidding. 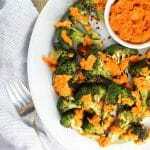 There are 3 grams of protein in 100 grams (about 1/3 cup) of broccoli. How cool is that? Broccoli contains more vitamin C than in Citrus fruits. Broccoli has more vitamin E than olive oil. Broccoli is rich in cancer fighting compounds. Broccoli is the best known source of Folate/VitaminB9. 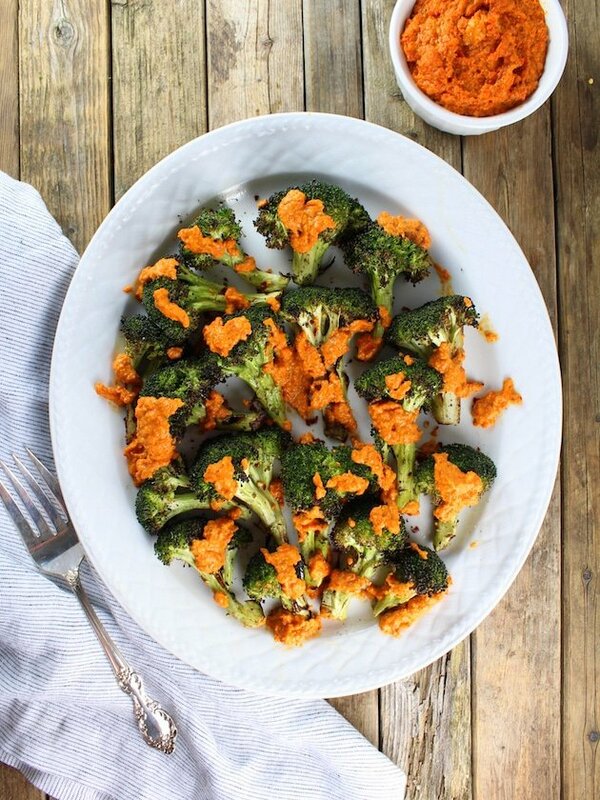 Broccoli boosts the immune system w/ high levels of Vitamin B1, B2 & B6. Broccoli contains absolutely no sugar or fat. Ya’ll, I was so inspired by this delicious goodness that I came home and went to work researching, chopping, mincing and grilling. 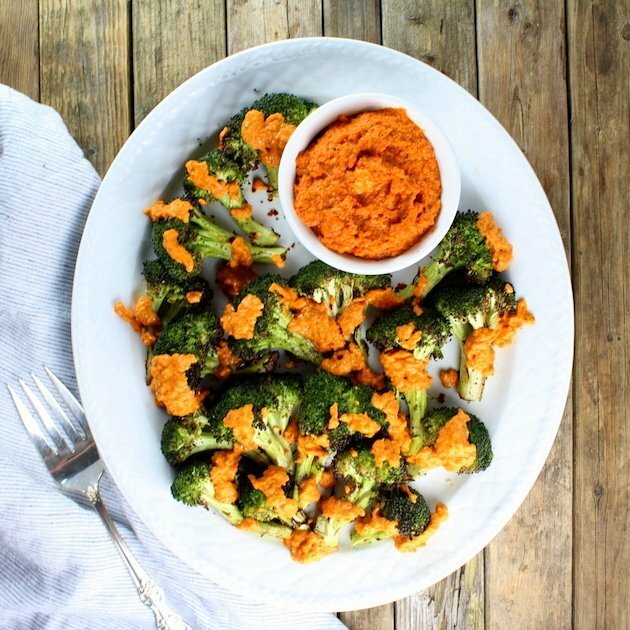 And whoomp there it is… Grilled Broccoli with Garlic Roasted Red Pepper Sauce!? 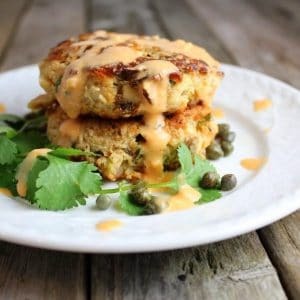 I absolutely LOVE this new recipe!? First reason: I don’t have to heat up my stove to make it… second reason: it brings variety to my veggie line up … and third reason: because it’s ridiculously good.? I have to come clean with you. 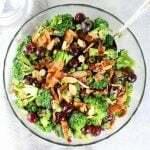 The night I created it B was out to dinner with a friend and I actually ate this grilled broccoli yumminess as my entire dinner.? That’s right – sans meat. I don’t know what to tell you other than: it’s super satisfying and I think it’s gonna be your new favorite veggie side dish.? First I cut my red peppers in half and removed the seed and veins. I smashed my garlic and removed the skin. Then grilled the garlic in a tin foil boat for 1-2 minutes a side as well as the peppers for 4-5 minutes a side, placed them both in a bowl covered with plastic wrap. Next I grilled the broccoli on 400 degrees for 13 minutes (turning it every few minutes) making sure it wasn’t over a direct flame to avoid over charring. Then I whipped up my Garlic Red Pepper Sauce. I minced the garlic, removed the skin from the red peppers. Then added them to the food processor along with the toasted almonds and bread, tomatoes, extra virgin olive oil, smoked salt, hot paprika and smoked paprika. While processing the ingredients I added a 1-2 tablespoons of water until it became a smooth consistency. I could literally eat the sauce with a spoon all by itself. 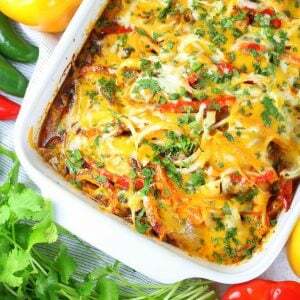 It’s smoky and earthy with a little bit of a kick from the hot paprika. 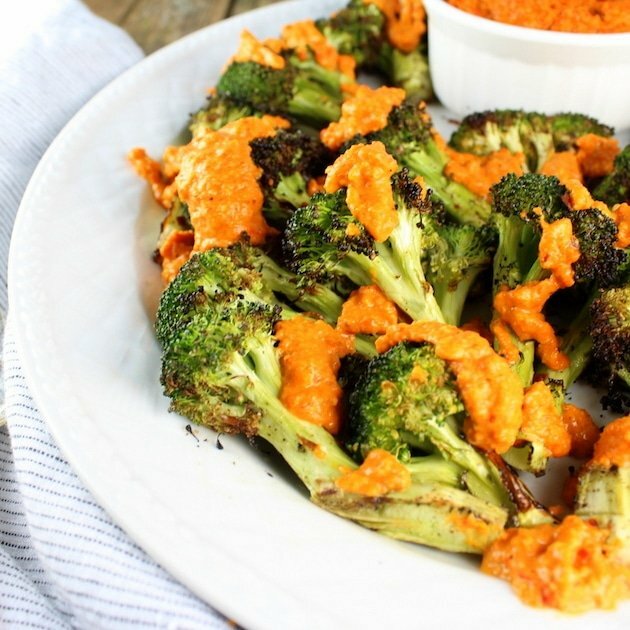 The broccoli is slightly charred, still a bit al dente, and pairs wonderfully with this garlic red pepper sauce!?? 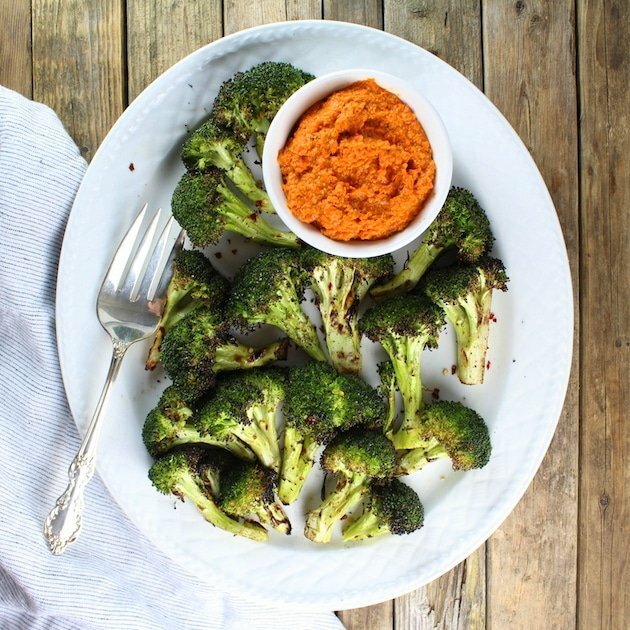 The perfect combo of roasted red pepper, garlic, almonds, paprika, tomatoes & slightly charred broccoli! 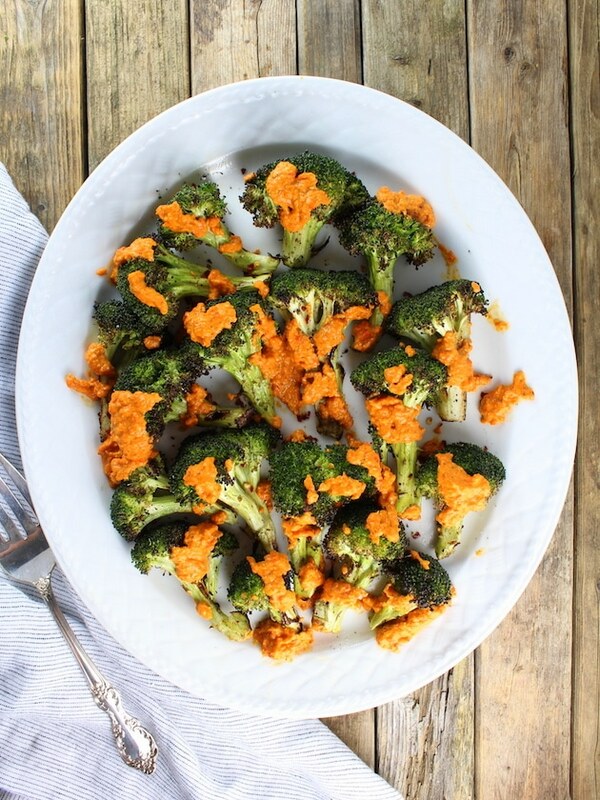 Rinse broccoli and cut apart florets. Slice pepper in half and remove seeds and veins. Create a small tin foil “boat” to roast garlic on the grill. Heat grill to 450-500 degrees. Place fresh garlic (skin removed) in the tin foil and roast on the grill for 2-3 minutes (don’t allow it to burn). Spray the pepper with canola spray, and grill until the skin is nicely charred, about 3-4 minutes per side. Place garlic and peppers in a medium bowl and cover with foil. Once the peppers are cool enough to handle, remove the skin from the pepper. 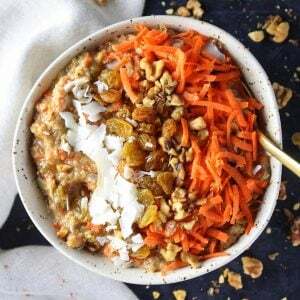 In food processor, combine roasted cherry tomatoes, almonds, both types of paprika, salt, bread, sherry vinegar, roasted garlic, roasted red peppers, and 1/4 cup of extra virgin olive oil. Process until ingredients are well-combined, adding 1-2 tablespoons water as needed to reach your desired consistency. 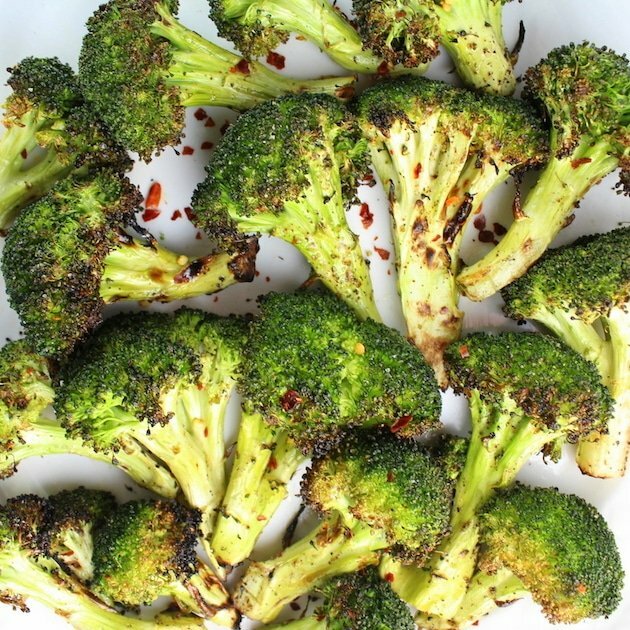 Turn the grill down to 400 degrees, and spray the broccoli with cooking spray. Grill the broccoli on indirect heat for about 13-15 minutes. 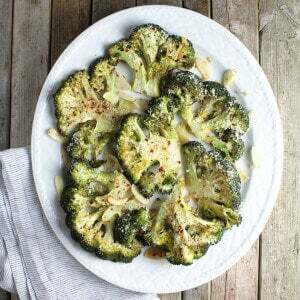 Closely monitor the broccoli and rotate every 2-3 minutes so that it has only the smallest hint of charring. 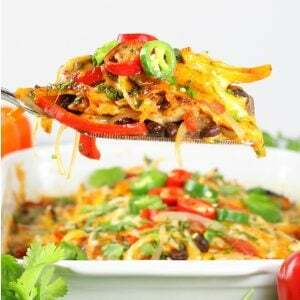 Serve immediately, topped with the Garlic Roasted Red Pepper Sauce. For the cherry tomatoes, I normally roast my own cherry tomatoes at the end of the growing season, and freeze them in batches to be used for recipes like this. Assuming you don’t have some in your freezer, you can either roast store bought cherry tomatoes prior to starting this recipe from Tyler Florence, you can find them sold in jars already roasted. For the crusty bread, either leave the bread sitting out a day or two in advance, or simply toast it in a toaster oven until it is nice and crisp – but not burnt! 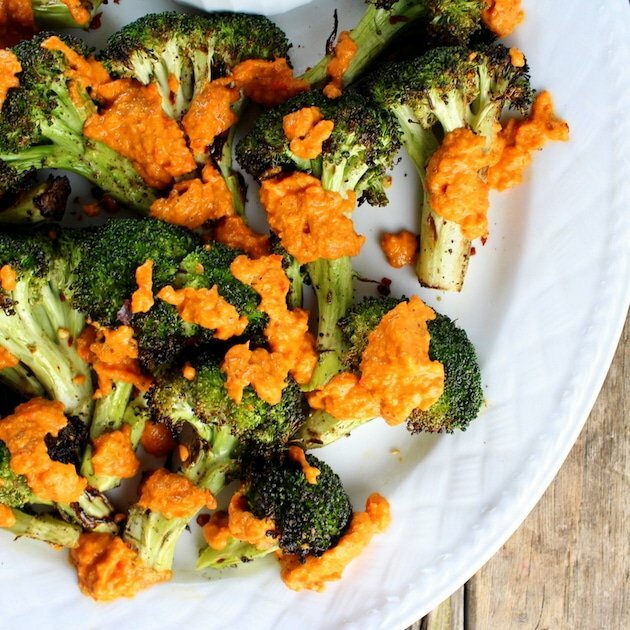 Looking for more amazing broccoli recipes? 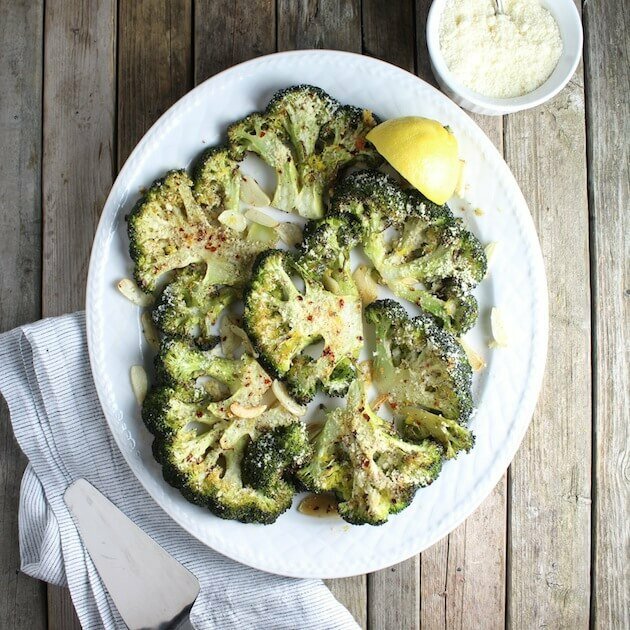 You have to try this Roasted Parmesan Broccoli! 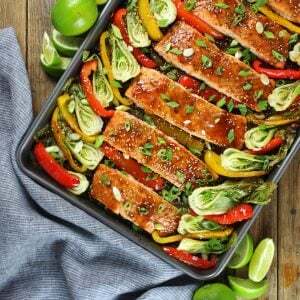 Yes – pretty much any way you cook it – it’s delicious!